...where there is so much to say but no energy to say it. I've got a 14 miler WAAAAYYY early in the morning so I'm definitely going to bed soon. I'm jet-lagged so it's not helping the whole sleeping thing right now. IMG_0878, originally uploaded by KnitterRunner. This was a wonderful first foray into crochet - easy enough for a beginner but an FO more interesting than a dishcloth. Don't get me wrong - I love a good dishcloth, I just wasn't in the mood to make another one at the moment. We walked to the center of downtown to watch the fireworks around 9. Meh, they were okay - the finale was cool. It was fun to do something that "normal" folks do. We're so spoiled with the WDW fireworks. All to often, as part of our theme park working culture, we forget there is a world out there not necessarily inhabited by tourists. It's a nice change. 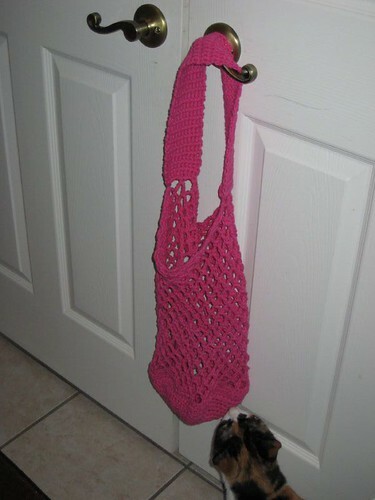 Off to shower (finally) and do some grocery shopping...I think I'll take my new bag with me!